Kids at Baccho ka Ghar were thrilled to participate. Eager to win, the kids made some beautiful paintings. Picking the winners was not an easy task. The kids we given a talk on the values most dear to Gandhiji. Competition was followed with a tasty meal, courtesy H2 Life Foundation. H2 Life Foundation President Mr. Vikas Sharma formed a close bond with the kids. 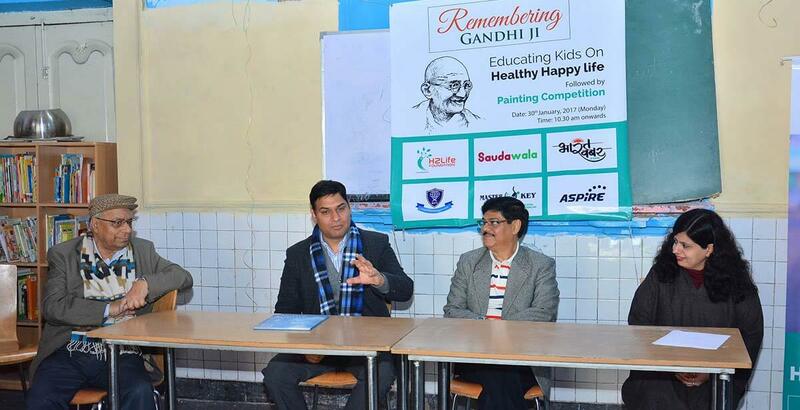 30 January 2017, New Delhi: H2 Life Foundation, a New Delhi based not for profit foundation and a public policy platform especially dedicated towards improving the health and happiness of the people organized an event titled “Remembering Mahatma Gandhi” as a mark of respect to the Father of the Nation on his Martyrs Day at ‘Bachchon ka Ghar’ an orphanage housing more than hundred children located at Daryaganj. Bacchon Ka Ghar was started by Hakim Ajmal Khan, an educationist, freedom fighter and legendary unani medicine practitioner. The event was supported by The Master Key Pvt. Ltd., Saudawala.com, Media Features India Pvt. Ltd., BharatKhabar.com, and Aspire Institute of Professional Studies as part of their CSR activity. The objective of the event was to remember Gandhi ji, learn from his life how to live a happy life, as well as educate kids on living a healthy and happy life. Fazi Hashmi, Senior IAS Officer (Retd.) was the Chief Guest at the event. He had a heart-to-heart talk with the children about what makes them happy and what they want to become. He also spoke about how they could incorporate Gandhi ji’s teachings in their lives to walk on a path of unity, discipline and non-violence in order to become good citizens of India and successful individuals. Vikas Sharma, President, H2 Life Foundation praised the kids for their beautiful drawings, and also shared with them the easiest path, that is the path of truth, as suggested by Gandhi ji to lead a happy life. He also said that a happy person will have a strong body, which will help him live a healthy life, thereby helping him achieve his goals. To become a successful doctor, soldier, engineer – education is important. For regularly going to school and studying, it is important for one to stay healthy and happy. So he requested kids to set their goals and work hard towards achieving them. H2 Life Foundation also organized a drawing competition for the kids. The winners were awarded with prizes while rest of the children were given certificate of appreciation by H2 Life Foundation to encourage and motivate them to put their feelings on paper. After the successful completion the event, H2 Life Foundation pledged to make every citizen of India full of health and happiness along with well being and positivity in their lives. The foundation also committed itself to provide its support and conduct similar events for spreading the message of a healthy and happy life.